February 2019 – Welcome to Wyandotte Daily! A proposed filling station and convenience store at 3801 Leavenworth Road received approval at the Unified Government Commission meeting Thursday night. It took nine votes to approve the Xpress Mart convenience store project, as a protest petition had been filed against it earlier. The owner and developer, Jay Jamal, was represented by Bryan Ruoff with 3F30 Architects. Nearby neighbors had filed a petition, and one neighbor in particular had said she would not be able to live there comfortably if the project went in, according to Rob Richardson, UG director of planning. To resolve the situation, the applicant purchased her home, he said. Richardson said the applicant plans to demolish the home. A real estate broker for the resident said that they now supported the project going through, and they had a new petition supporting it. However, according to the UG’s attorney, the commission still had to have nine votes for the project because the protest petition had been filed earlier. The developer asked the UG to drop its requirement to provide screening and landscaping on the side of the property near the neighbor’s home, since it would no longer be an issue, and the UG planning staff agreed. Also, the developer said he was complying with all the other UG requirements on the project. Appearing in support of project was Lou Braswell, executive director of the Leavenworth Road Association, who said the organization sees this project as a great asset, and they hope it will bring in more revenue and more business in the area. The project had previously been before the UG on Jan. 31 and was held over until Feb. 28. A 4,000-square-foot convenience store, an eight-pump gas station and two retail tenant spaces with 2,346 square feet were planned, according to UG planning documents. The property was vacant since 2008, according to the documents. Jamal has two other stores in Kansas City, Kansas, including one at 1800 Steele Road and one at 33rd and Brown, and he has developed 12 stores in all, he told the commission. Commissioner Gayle Townsend said she was happy to learn that the two sides in this issue had come to a resolution. The UG Commission overturned a Planning Commission decision to deny a zoning change to heavy industrial district for a 10-day transfer facility for hazardous materials and hazardous waste containers. Under the proposal, containers would be transferred from one truck to another at the site, 1620 S. 45th St. The applicant, Tita Lagrimas with Tradebe Environmental Services, explained that most of the materials they handle are nonhazardous, and that his business has been operating in the area for five years without problems, at another location. He said the materials in the drums are never opened and are shipped out to another city. The applicant also described several safety and security procedures they have in place. Commissioner Angela Markley said she supported this proposed business, as it was in an industrial area that was not close to homes. The issue required eight votes to approve since it overturned the Planning Commission, and the vote was 9-0 in favor of it. Action on a proposed ordinance on small box variety stores, which include some dollar stores, was tabled for more discussion at a later meeting. The UG Commission had passed an ordinance in 2016 requiring a special use permit for these stores, but it was inadvertently deleted when another ordinance was passed, according to a UG legal staff member, Patrick Waters. The 2016 ordinance was modified to bring it up to date, to strengthen it and to avoid potential legal issues, according to the legal staff. A Kansas City, Kansas, study from 2017 was cited, along with a study from New Orleans, to show the need for this ordinance. One company, he said, has stated that the UG’s ordinance favored in-state companies over out-of-state companies. The proposed ordinance would have applied only to new stores that would move in, and would have set a certain percentage requirement of the shelf space for fresh and frozen food, that would exempt the stores from this regulation, according to officials. A few years ago, UG commissioners were concerned about snack foods at box stores that were not considered to be healthy. Some of the stores were not carrying healthy, fresh foods, and there was a lack of grocery stores in some areas. Pete Peterson, an attorney representing Colby Capital, appeared in opposition on Feb. 28, but said he would wait until the later meeting to make his remarks. At the City Planning Commission, according to the UG planning documents, one issue discussed was the right of people to select the foods they wanted and of stores to offer items they wanted to sell. Also discussed was the higher incidence of certain diseases, such as diabetes, in the city. The Planning Commission approved the proposed ordinance, 9-0, earlier in February. Commissioner Mike Kane on Feb. 28 said he would like the UG’s staff to provide more information about what cities close to the size of Kansas City, Kansas, and that are located nearby, have done about this issue. He asked for more information. Commissioner Brian McKiernan asked for the commission to thoroughly consider any unintended negative consequences that might come about as a result of this ordinance. Commissioner Ann Brandau Murguia requested a short special session because there were a number of new commissioners who were not here when the change was made in 2016. In other action, the commission at 5 p.m. tied in a 5-5 vote between two candidates for municipal judge. The commission decided to wait another week, when another commissioner returns, to take another vote on the issue. Interviews were held with three candidates for the position at the 5 p.m. meeting. The Kansas City T-Bones announced today that the club has partnered with two area universities to bring college baseball to T-Bones Stadium in 2019. Baker University will play host to Missouri Valley College for a three-game set, with a double header at 1 p.m. Saturday, March 16. The two teams will play again at 1 p.m. Sunday, March 17. The second part of the schedule will feature Pittsburg State University playing host to Northwest Missouri State on Tuesday, April 9, with a single game starting at 6 p.m.
“Baker University is very excited to partner with the T-Bones organization for this series,” said Baker Athletic Director Nate Houser, in a news release. “We’re excited to play at T-Bones Stadium. This will be a great experience for our players and our Kansas City alumni. We’re looking forward to hosting Northwest Missouri, and I know they have a great following in KC as well,” said Bob Fornelli, head coach of the Pittsburg State Gorillas. Tickets prices are set for $8 for the public and $5 for students and staff (must show your school ID). The T-Bones are offering a special on available suite rentals, starting at minimum of 10 tickets at $15 each. Tickets are set to go on sale at 10 a.m. Friday, March 1, and they can be purchased online at www.tbonesbaseball.com or by calling 913-328-5618 or by visiting the Saint Luke’s Health Systems Box Office between the hours of 10 a.m. – 4 p.m. Monday through Friday. Full and half-season 2019 T-Bones ticket packages, as well as mini plans, are on sale now online by calling 913- 328-5618 or by visiting the T-Bones Stadium offices. Group ticket sales are also on sale now. Wyandotte County residents will be able to purchase individual game tickets beginning at 10 a.m. Tuesday, March 19, and the public on Thursday, March 21. Opening day for the T-Bones is set for Friday May 17 at T-Bones Stadium when the T-Bones play host to the Fargo-Moorhead Redhawks to open the 2019 season. College costs more than ever, but can you afford to skip it? College is your best bet for higher earnings long-term. Only three in 10 people who stop at a high school diploma will manage to land what Georgetown University researchers term “good jobs” — jobs that will earn you at least $35,000 in your mid-20s through early 40s, and at least $45,000 after middle age. And the bulk of those “good jobs” for people with a high school diploma alone go to men. Not all four-year degrees offer clear-cut paths to great paychecks. In today’s era of college debt, it’s worth knowing not just what you’ll pay for college, but what you’ll earn. Nearly a third of U.S. adults have bachelor’s degrees nowadays. That means the letters “B.A.” or “B.S.” on your resume don’t carry the same weight they did back when those distinctions were rare. Georgetown’s interactive college majors tool shows you incomes nationally or by state. The average arts major in Kansas earns $42,000. A bachelor’s in psychology, social work or education will earn you about the same. Majors like health, communications and biology land in the $50,000 range. Math, computers, architecture and engineering reach the $80,000 range. The cost of your degree can vary a lot — even at public, in-state universities. Use Kansas DegreeStats to compare costs and outcomes of specific degrees at in-state public two and four-year colleges. A quick search for aerospace engineering, for example, indicates that degree costs $20,000 more at the University of Kansas than Wichita State. Yet a degree from either school will set you up for the same sort of pay five years after graduation. It also reveals how much students tend to receive in scholarships and other helpful information. To save on a four-year degree, you could start at a community college then transfer. But be sure to check which credits will transfer, so you don’t end up losing time and money. Consider community and technical colleges for a faster, cheaper path that sometimes comes with a bigger payoff than four-year education. 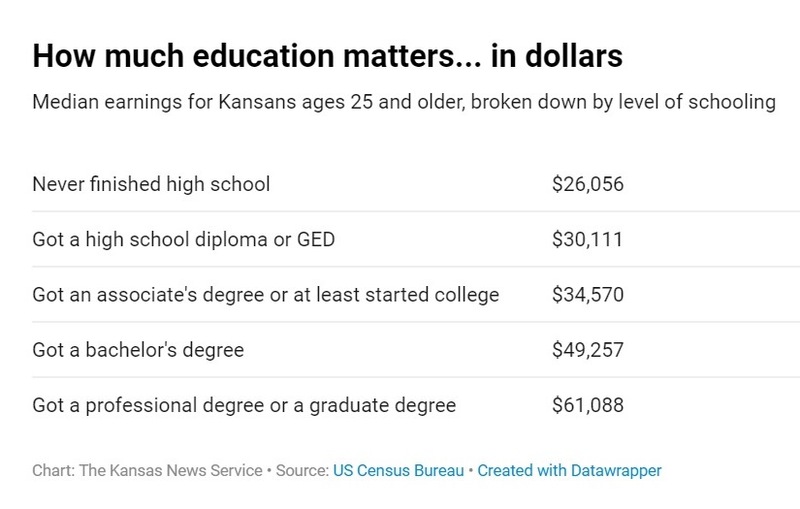 Among the hundreds of degrees available at public two and four-year colleges in Kansas, the one that pays the best five years after graduation is an associate’s degree, not a bachelor’s: an electrical lineman program. Nationally, Georgetown says two-year grads with science, technology, engineering — or STEM — degrees earn an average of $60,000 and those with two-year health degrees earn $52,000. Even some shorter credentials in STEM, for example, can pay better than many bachelor’s degrees. Author Info WyandottePosted on Feb 28, 2019 Feb 28, 2019 Categories Education, NewsLeave a comment on College costs more than ever, but can you afford to skip it?